Life After Reaching Your "Goal"
Most people who start a weight loss journey have a goal in mind. A goal weight, a goal size; etc. This is where the hard part comes in; what happens when you reach that goal. Does that mean your journey is over? I think this is where a lot of people go wrong. Reaching your goal shouldn't be an end point, but instead the beginning of a new life. When your primary goal has been reached it's hard to think of what comes next. I mean you did it, can't life just be normal again? Well the answer to that is no. Your old normal will not help you succeed, instead you need to find a new normal. It is so rewarding to set a goal and work to reach it, when that feeling of accomplishment is no longer in your reach it's hard to keep going. For me once my goal weight was reached I knew I needed to find something else to strive for. I was lucky enough to fall in love with running during my weight loss journey, so the new goals were easy to find. I wanted to run faster; further and better. It was so nice I was setting a breaking goals every week. But just like weight loss at some point you are bound to plateau, I mean it's not that I don't think I can never getting any better at running, I'm sure there is always room for improvement but I want to still love running and I'm not sure if I would if I pushed much harder. So this is where the big LIFE LESSON comes in. Life is all about adapting; constantly changing plans, ideas and goals. So I started to set different goals once again. Through out my entire journey I have done strength training but just enough to stay toned. So once running wasn't as challenging anymore I decided to start doing more weight lifting. Don't get me wrong here I still run EVERYDAY, as a matter of fact I am on day 636 of running 1+ mile a day. The awesome thing about weight lifting is it changes your body and your mind. I love getting stronger, being able to do things I never thought were possible. Now on to my next HUGE challenge. I signed up and have been training for a SPARTAN RACE. The training is some of the most challenging and rewarding training I have ever done. 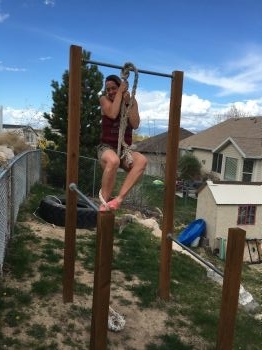 I used to be scared of holding up my own body weight, now I can do pull ups, climb ropes, flip tires and I truly feel like if I put my mind to it I can do anything. 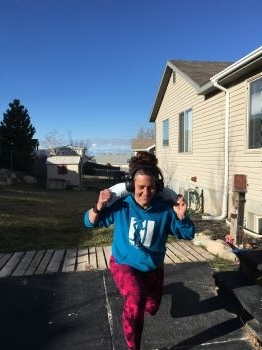 I went from being and unmotivated, lazy, 300+ pound person who could barely walk around the block to being a running, weight lifting, Spartan training machine! So just remember, ANYTHING is possible. If I can do it, ANYONE can do it. Thank you for always inspiring me!! .... and encouraging me to reinstate my 1 mile every day goal! You are an inspiration! May your continued journey be filled with "I can" moments! This really makes me want to keep going! You are such an inspiration. Just amazing! I'm hanging on every word of your blog because, as you know, I hit my goal weight and did return to "my old normal" and that did not work. I am 2/3 of the way back down to that goal weight and I am going to approach it differently when I get there. I have to admit, I'm scared of failing at maintenance again, but seeing your success gives me confidence that I can do it too! Thank you for sharing and staying connected with Spark. I can't wait to hear how the Spartan race goes. You look beautiful and strong and happy. That's exactly how I want to feel! One goal that I have set over the past few years is a goal that you can never reach for sure but keeps me on the journey is to seek my optimum health at whatever age or stage I am in. You are amazing and I am sure are so proud of yourself. Congrats!